I love everything about meringue kisses: their crisp outer shell and soft marshmallowy centre; the fact that they are so versatile and can be decorated any way you like; the list goes on. When I’ve made these in the past I’ve focused more on the aesthetics, painting them with green and red stripes. But this year I’ve gone for a much more subtle design. 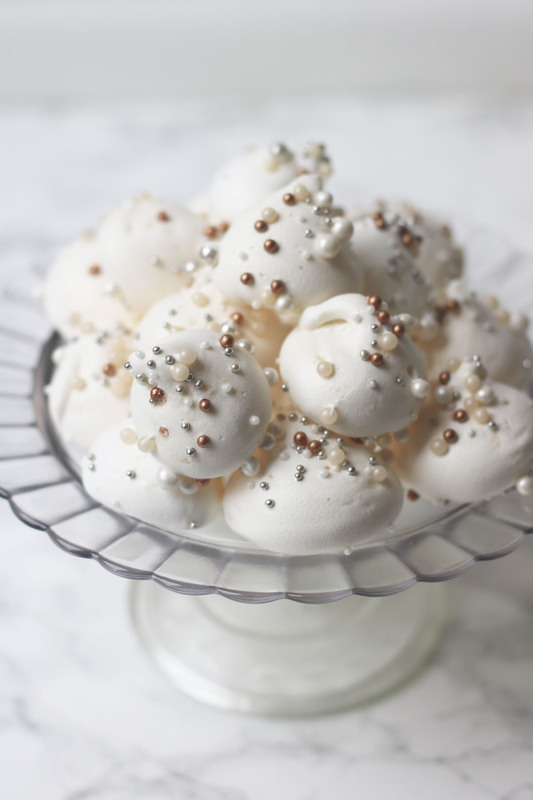 White, silver and copper pearls are scattered over the meringue immediately before baking for a chic, elegant look. 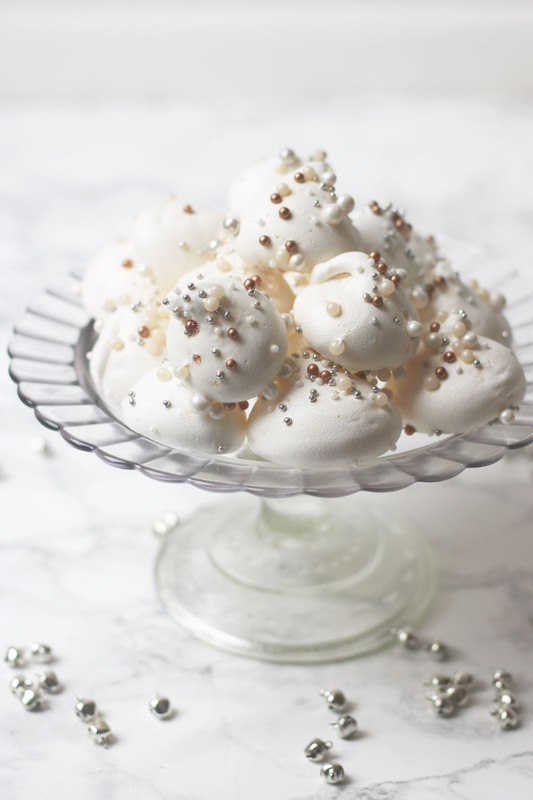 With their shimmering sprinkles, these meringue kisses are perfect for serving at your New Years Eve party! They are pretty sweet so I recommend serving with a lovely dry champagne or prosecco. If you’ve ever tried flavouring meringue you’ll know that some flavourings just don’t work. Anything wet is basically a complete no-go – forget fruit juice or liquid flavour extracts! Instead, powdered/dry flavourings work best. Desiccated coconut being nice and, well, dry is ideal! You follow the same process as you ordinarily would when making meringue, you simply fold in a couple of tablespoons of desiccated coconut before you transfer the mix to your piping bag. It really is that simple! Feel free to experiment with your own flavours so long as they are in dried powder form (like freeze dried raspberries or cocoa powder). These coconut meringue kisses are the perfect treat to serve up at your New Years Eve party. Once all of the sugar has been added to the mixture, add in the desiccated coconut and whisk on high for another 5 minutes to ensure the egg whites are thick, firm and glossy. Fill a piping bag with the meringue and cut a large opening at the bottom of each bag. Pipe the meringue kisses by holding the piping bag upright, squeeze gently and lift away as you stop applying pressure. Sprinkle over oven safe sprinkles (i.e. ones that won't melt) if using. Weigh your egg whites first. It is unlikely you will have exactly 150g but don't worry, simply double the weight and use that much caster sugar. The ratio should always be 1:2 egg white to caster sugar. Happy new year from Supper in the Suburb!